Children need to be protected and Kay Green the creator of My Precious Kid has come up with an innovative solution that every parent should invest in. It is called the Child Safety Pack. The Child Safety Pack was designed to help protect children when in situations such as car accidents, getting lost, traveling, or even just being alone with a babysitter. This entire kit is only $15.99.? They also offer a Child Safety Pack Plus which includes everything listed above as well as a Toothprint Dental Impression Kit for only $24.99. It is interesting to think that 90% of our pets have identification on them at all times, but only 2% of children have identification on them.? This is scary, especially in this day and age. Kay’s mission is to provide ?A Gift of Safety – child safety and baby gear products for your precious child.? I was so blessed to receive a complimentary Child ID Card in the mail from My Precious Kid and I love how on the card itself it has a place to put a photo of your child, emergency numbers, allergies, and even doctor’s name & info.? There is also a place for the parent to sign authorizing medical treatment for the child in case the parent is absent. I was amazed to see all the great products they are offering on their site – car seats, potty training pants, craft kits, drinking bottles, and much much more.? 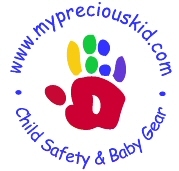 So be sure to check out the My Precious Kid website as well as their Child Safety Blog and make the decision to keep your child safe no matter what the cost. They have offered my readers a 10% discount on any purchases!? YAY!